Blitz! 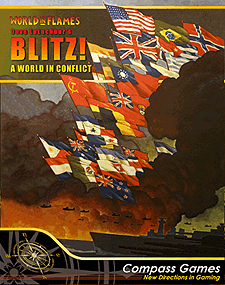 A World in Conflict is a grand strategy game where players fight all the battles and manage all the economies of the five major powers who fought World War II: Germany and Japan for the Axis, and for the Allies: the Anglo-French Alliance (Great Britain, France, the British Commonwealth nations, and all of their colonies), the USA, and the USSR. Developed in cooperation with the Australian Design Group, Blitz! A World in Conflict brings the award-winning tradition of World in Flames into a reimagined format that is much faster to play, with beautiful components, while maintaining the premiere historical accuracy of World in Flames. The game is driven by player choices. First you choose which units to research and develop and then you'll select which of your available army, air force, and naval formations to build and deploy. Should Germany first build up Army Group Center, the High Seas Fleet, or the Luftwaffe? Will Japan's Kwantung Army defend Manchuria against the USSR, join the attack in China, or defend an overseas base?